Our collection of sharpeners includes some of the big names from the industry, which are widely known for their quality cutlery sharpeners. These sharpeners are made from the premium grade steel and are available in different variations as per your sharpening needs. You will find our round and oval steel sharpeners very effective in realigning the bend or twisted little teeth located on the blade's cutting edge. 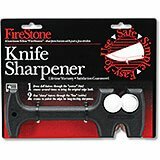 These sharpeners have fine cuts and with their regular use, you will be able to keep the blade's edge sharp throughout the day. If the blade of a knife is completely worn out, then you are going to need our diamond steel sharpener to bring the blunt blade back in its original form. 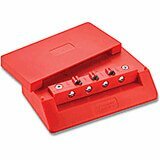 You can also buy sharpening stones, multi-oilstones with reservoir unit, 3-way sharpening systems, manual knife sharpeners, and more from us. All Victorinox Swiss Army cutlery products are backed by a lifetime guarantee against manufacturer's defects. A combination cut sharpening steel has two grades of honing faces, on 4 different sides of the steel. The fine faces are on opposite sides, the coarse faces are on opposite sides.Durable nylon handle is NSF approved and dishwasher safe. Even though all nylon handles are dishwasher safe, hand-washing is recommended to prolong the finish of the handle. All Victorinox Swiss Army cutlery products are backed by a lifetime guarantee against manufacturer's defects. Durable nylon handle is NSF approved and dishwasher safe. Even though all nylon handles are dishwasher safe, hand-washing is recommended to prolong the finish of the handle. All Victorinox Swiss Army cutlery products are backed by a lifetime guarantee against manufacturer's defects. Hand-washing is recommended to prolong the finish of the handle. A Steel sharpener also known as a honing steel is the best knife sharpener to use on a daily basis. Durable plastic handle is NSF approved and dishwasher safe. Even though all plastic handles are dishwasher safe, hand-washing is recommended to prolong the finish of the handle. A Steel sharpener also known as a honing steel is the best knife sharpener to use on a daily basis. 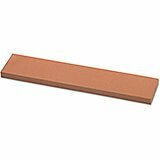 11.25" x 2.5" x 1"
This double sided stone has a coarse side for reshaping and reforming your edge and a fine side for honing, strengthening, and finishing. The Crystolon Combination Stone is particularly good at sharpening badly worn blades quickly. Silicon carbide combo stone. Plastic Handle - With Hang-tag. 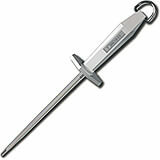 Durable plastic handle is NSF approved and dishwasher safe. Even though all plastic handles are dishwasher safe, hand-washing is recommended to prolong the finish of the handle. A Steel sharpener also known as a honing steel is the best knife sharpener to use on a daily basis for your kitchen knives. Plastic Handle - With Hang-tag. Durable plastic handle is NSF approved and dishwasher safe. Even though all plastic handles are dishwasher safe, hand-washing is recommended to prolong the finish of the handle. A Steel sharpener also known as a honing steel is the best knife sharpener to use on a daily basis for your kitchen knives. Diamond Steels put an edge on a knife that cannot be sharpened with regular knife sharpeners. Durable natural wood handles. Wood handles provide good grip, and most people consider them to be the most attractive. However they should hand-washed, not dishwasher safe. You can occasionally treat wood handles with mineral oil to prolong their finish. All Victorinox Swiss Army cutlery products are backed by a lifetime guarantee against manufacturer's defects. Handle, With Hang-tag. Hand-washing is recommended to prolong the finish of the handle. A Steel sharpener also known as a honing steel is the best knife sharpener to use on a daily basis. Handle With Hang-tag. Hand-washing is recommended to prolong the finish of the handle. A Steel sharpener also known as a honing steel is the best knife sharpener to use on a daily basis. Handle With Hang-tag.Durable polypropylene handle is NSF approved and dishwasher safe. Even though all polypropylene handles are dishwasher safe, hand-washing is recommended to prolong the finish of the handle. A Steel sharpener also known as a honing steel is the best knife sharpener to use on a daily basis for your kitchen knives. 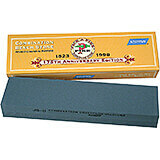 8 x 2 x 1"
This Combination Stone helps you keep your blades sharp. 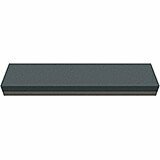 This double sided stone has a coarse side for reshaping and reforming your edge and a fine side for honing, strengthening, and finishing. All Victorinox Swiss Army cutlery products are backed by a lifetime guarantee against manufacturer's defects. 5/16" Dia. Thin Plastic Handle - With Hangtag. Durable plastic handle is NSF approved and dishwasher safe. Even though all plastic handles are dishwasher safe, hand-washing is recommended to prolong the finish of the handle. A Steel sharpener also known as a honing steel is the best knife sharpener to use on a daily basis. 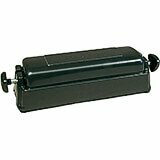 Black, Stainless Steel Knife Sharpener, 10"
10" X 1.5" X 3"
This 9" knife sharpener is a necessity for any professional chef. While sharpening knives, maintaining the right angle usually requires some effort and a fair amount of practice. This manual sharpener solves it all by providing a preset angle for flawless and effortless sharpening. Black, Stainless Steel Oval Sharpening Steel, 11.88"
The Paderno World Cuisine 11 7/8" inch oval sharpening steel is popular with butchers as the oval shape allows for a broader surface to be sharpened. Black, Stainless Steel Round Sharpening Steel, 10.25"
The Paderno World Cuisine 10 1/4" round sharpening steel reshapes and realigns the edges of the blade. It has a medium grit, is round in shape and has a black plastic handle. Black, Steel Fine Sharpening Steel, 12.25"
Chrome-Molybdenum Steel, Giesser Messer Sharpening Steel. Standard cut. Length of blade 12 1/4". This replacement stone works for the 12" 3-Way Honing System (41010). Coarse stones are ideal for badly damaged blades with extremely worn edges. They are the first stop in bringing damaged edges back to life. 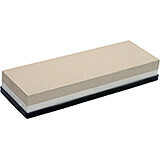 When using a sharpening stone one must always remember to apply oil or water to it first to ensure that the blade glides across the stone correctly. 8.25" X 2.75" X 1.12"
11.75" x 2.75" x 0.5"
This replacement stone works for the 12" 3-Way Honing System (41010). Fine stones produce a very sharp edge ideal for keeping kitchen knives in peak condition. Fine stones also remove the least material when sharpening so a coarse or medium stone should be used first on badly damaged and extremely dull knives. 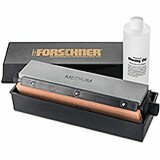 When using a sharpening stone one must always remember to apply oil or water to it first to ensure that the blade glides across the stone correctly. 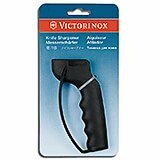 Victorinox Swiss Army handheld for sharpening. Its compact design fits easily in a kitchen drawer. Crystolon stones. Replacement for multi-oil stones 40997. Alumina Oxide material, Fine Grit for keen edges and quality finishes. All Victorinox Swiss Army cutlery products are backed by a lifetime guarantee against manufacturer's defects. This Edge Maker System It's a three position pull-thru sharpener that functions like a hand held sharpener. It has Tungsten Carbide blades to reset the angle of the edge of the knife. 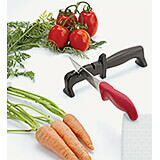 Sharpen your Kitchen cutlery with this two-stage set honing set. The ceramic stone sharpens to a hollow ground edge and the white stone gives the blade a final polish. The handheld sharpener measures 8" x 3" x 1". 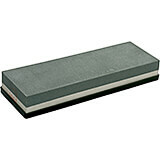 11.5" X 2.5 "X .5"
This replacement stone works for the 12" 3-Way Honing System (41010). Medium stones produce an average edge that is suited for kitchen shears, griddle and pan scrapers and other common kitchen utensils. When using a sharpening stone one must always remember to apply oil or water to it first to ensure that the blade glides across the stone correctly. 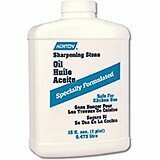 This Mineral Oil is essential if you want your sharpening stones to perform at their best. The process of sharpening a knife creates frictional heat and over time this clogs the tiny pores that speckle your sharpening stone. To clean these pours, and help lessen frictional heat, applying water or an appropriate oil to a stone is necessary to aid the process and make sharpening your favorite blade smooth and trouble free. Specially formulated pharmacopeia grade mineral oil. 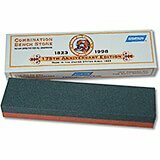 This coarse stone will restore worn edges on a knife blade. It fits the Victorinox 40997 Crystolon stone sharpener. Crystolon single grit, coarse silicon carbide. The Paderno World Cuisine 240/coarse sharpening stone, made of silicon carbide, reconstitutes a damaged edge.